In a saucepan, heat oil over medium. Add onion and cook until softened, 5 to 6 minutes. Add rhubarb, raisins, sugar, ginger, and cinnamon stick. 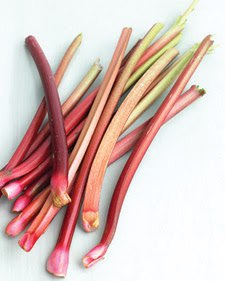 Cook over medium, stirring occasionally, until rhubarb begins to break down, 6 to 8 minutes. Remove cinnamon stick and stir in vinegar. (To store, refrigerate, up to 5 days.) Serve with ham or pork and cornichons. **I didn't have a cinnamon stick, and I think I might have added too much cinnamon... I just shook some in, so if that is the case for you... be careful not to add too much... go ahead, try it!